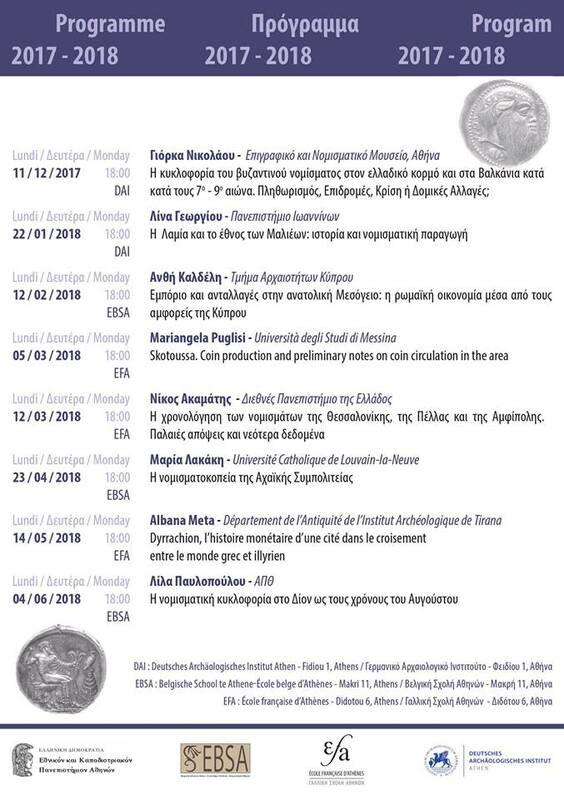 The Numismatic meetings are a joint organization of the Belgian School at Athens (EBSA), the National and Kapodistrian University of Athens (EKPA), the National Hellenic Research Foundation (EIE-IIE/TEPA), the French School at Athens (EFA), the German Archaeological Institute at Athens (DAI). These Meetings take place on an almost monthly basis at the Seminar room of the National Research Foundation. This is the permanent academic activity of the EBSA focusing on one of the aspects of expertise of both the EBSA and Belgium. 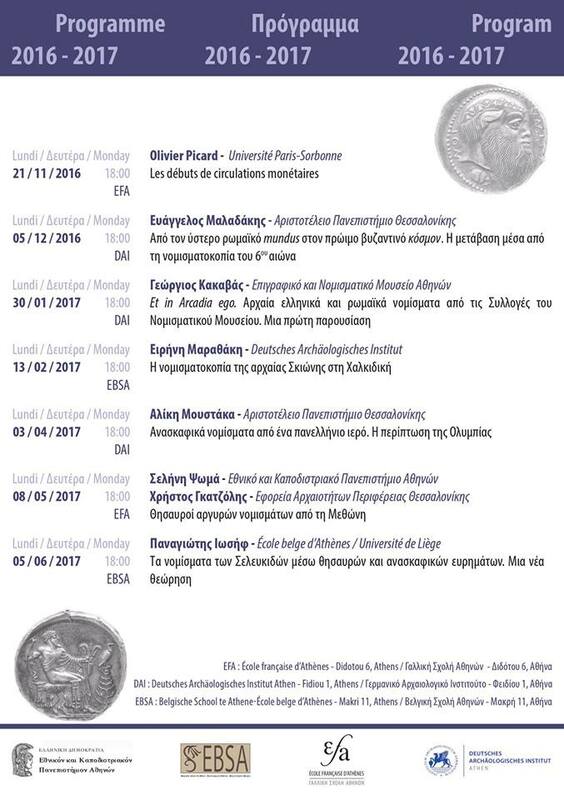 The Numismatic Meetings are now running for the sixth year and the programs of each year are available in the images and documents attached to this page or can be consulted on the 'Home' section of the present webside and on the Facebook page of the EBSA as well. 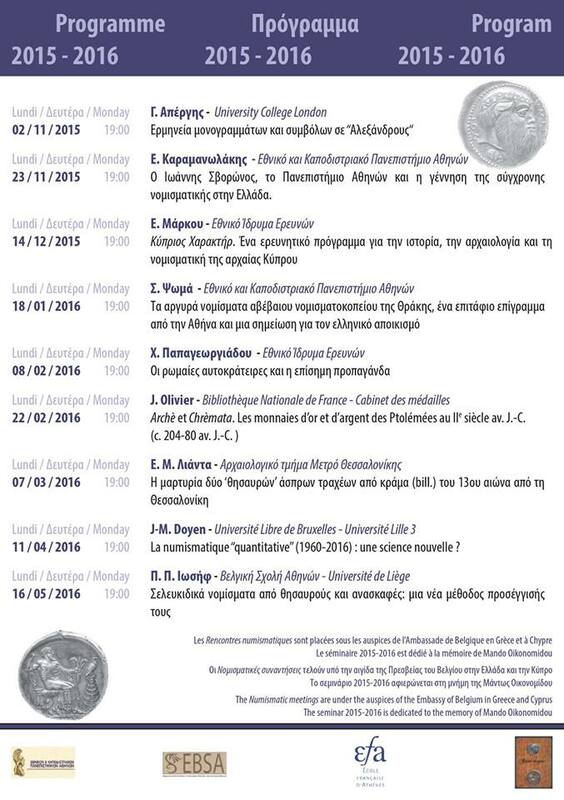 The Belgian School at Athens is happy to announce its first postgraduate Summer School. 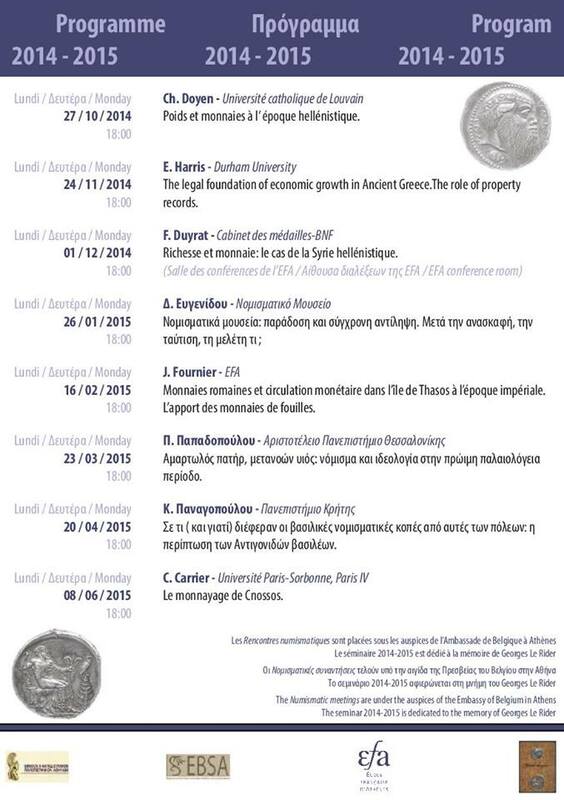 This 9-day seminar focuses on Greek numismatics. Questions of method, history, archaeology, and economy will also receive attention. All courses and presentations will be in English. At the end of the seminar, participants will deliver a presentation on an imposed topic (based on their academic background). 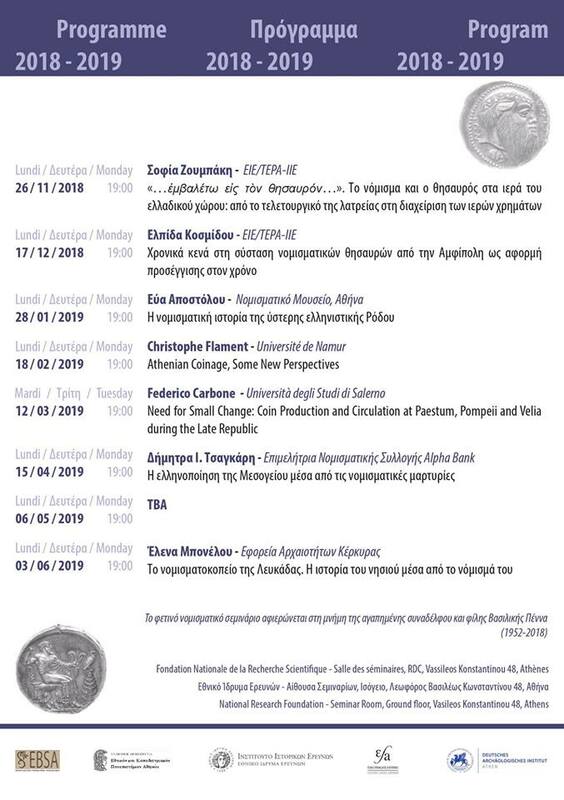 The full program of the courses and visits to Athenian numismatic collections is given below. Applications – a letter of motivation and a CV – should be sent to the organizers [François de Callataÿ (FdC-Royal Library of Belgium/Ecole Pratique des Hautes Etudes, Paris/Université Libre de Bruxelles) and Panagiotis P. Iossif (PPI-EBSA/Université de Liège)] via email to the following address: info@ebsa.infowith the mention “Numismatic seminar: Application”. The deadline for applications is Tuesday, May 31st, 12 am. The seminar will take place at the Belgian School at Athens, at the foot of the Acropolis (Makri 11, GR-117 42, Athens;www.ebsa.info) and lodgment to participants will be offered, as well as free access to the main Athenian libraries and passes to Museums and archaeological sites. An inscription fee of 70 € is asked for file preparation and registration.